I've just entered a design competition through online store OhhDeer.com adapting some images that may be already familiar to you, dear Reader. The concept of the contest is as follows: I create the pillow/cushion design (or three in this case) which is uploaded onto their site. At the end of the 'live' period (I think it's mid November) the designer of the cushion with the most social media sharing AND sales will be asked to join their collective. It's a very clever device and a good way for them to see a whole range of artists' work, but within a real commercial setting. If you're reading this, please share your favourite cushion (via the relevant Facebook link on the OhhDeer.com website) or even buy one! Even if I don't win, the automatic designs the competition creates look great, and may have inspired me to do something like this myself in the future. Click on each design below, and it will take you to that product on OhhDeer.com. I'd been wanting to do a piece involving the dragon statues that encircle the boundaries of the old City of London for a while. When I discovered that they were not all the same design or size, an idea of a leader (plus troops) began to form. So on a bright spring day, earlier in the year, I set off to find all thirteen of the dragons to photograph (or at least observe) them in their 'natural habitat'. After a lot of leg work and standing by the side of busy roads, I headed home only to discover that although Wikepedia had listed 13, I'd only established the existence of 12. Oh no! Had I missed one? Another web search revealed that I hadn't: the firebreather has been taken into safe storage whilst the Crossrail project carves it's way under London according to The Daily Constitutional. So, the final piece in getting my ideas together was found - my picture would be a gang of dragons hunting down their missing colleague. You can read more in this feature about the work on popular London website Londonist. If you're a fan of ancient reptilian London creatures, the Victorian dinosaur sculptures in Crystal Palace Park are worth a visit. 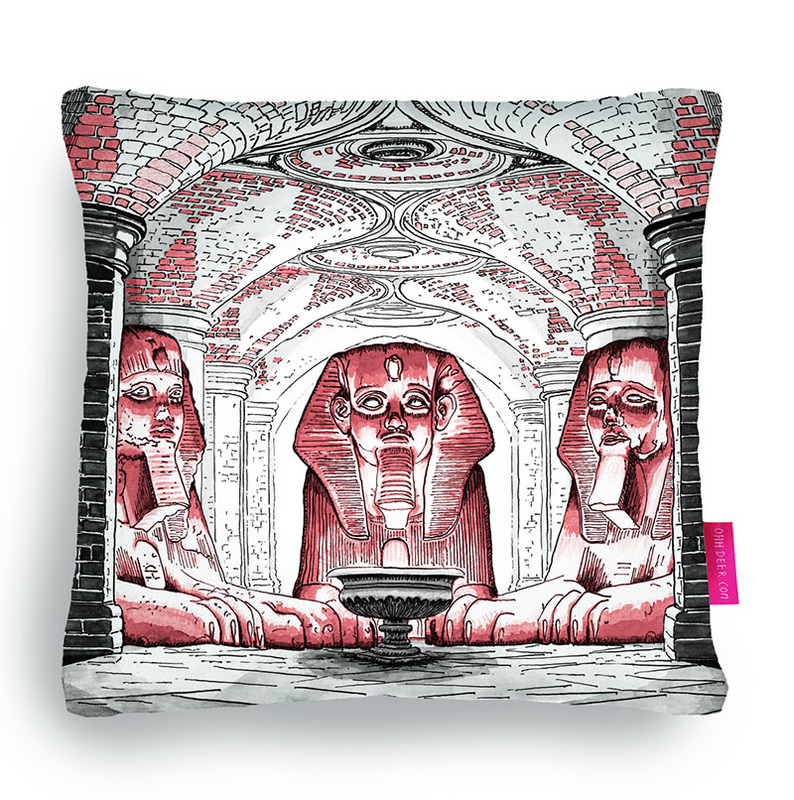 I've even had some cushions made featuring my Crystal Palace Monsters design (also available via my online store).